The modulation performance of the optically injected gain lever (OIGL) semiconductor laser. Former: Schematic of the experimental setup. The gain lever laser, which is composed of a short modulation section and a long gain section CW biased, is coupled to an external master laser. Latter: 3-dB bandwidth in the stable-locking region of the OIGL laser with g = 10 and ε = 10−16 cm3. g: damping rate ratio of the two parts of the gain lever laser. ε: gain compression factor. Development of ultrafast chips operating at speeds exceeding 100 GHz is of paramount importance for increasing the transmission capacity of fiber-based networks, directly impacting 5G wireless networks, internet, local area networks, metropolitan area networks, and long-haul backbones, thus bringing closer to the concept of networked society. Although complex modulation formats combined with digital signal post-processing are usually preferred to reach ultra-high modulation bandwidth, the long latency introduced by electronic processing results in a severe communication bottleneck. To this end, direct-detection systems implemented with directly modulated semiconductor lasers constitute a simple and compact solution for low-cost fiber optic communications. In these systems, the electro-optic 3-dB modulation bandwidth (in GHz) of a directly modulated laser is the most important figure-of-merit that determines the maximum data rate (in Gbps) achievable. To keep increasing the data rate, the enhancement of the electro-optic 3-dB modulation bandwidth without causing other impairments is highly desired. Such improvements are usually obtained either from the development of novel in-plane semiconductor materials or from nonlinear architectures like the optical injection-locked gain lever laser, which is the solution proposed by J. M. Sarraute, et al. in this research. The work is published in Photonics Research, Volume 4, No. 4, 2017 (J. M. Sarraute, et al., Effects of gain nonlinearities in an optically injected gain lever semiconductor laser). As described in the figure, the gain lever laser is composed of a short modulation section and a long gain section continuous wave biased. In order to maximize the gain-lever effect, the gain section is biased at high gain and the modulation section at low gain level as seen in the corresponding diagram. In such a case, a strong radio frequency optical gain will result, leading to an increase of the electro-optic 3-dB bandwidth. To further enhance the modulation dynamics, the gain lever laser is coupled to an external master laser. In particular, when the strength of the injected light and the frequency detuning between the two lasers fall within a certain range, an injection-locking regime takes place, hence pushing forward the electro-optic 3-dB bandwidth close to 100 GHz. 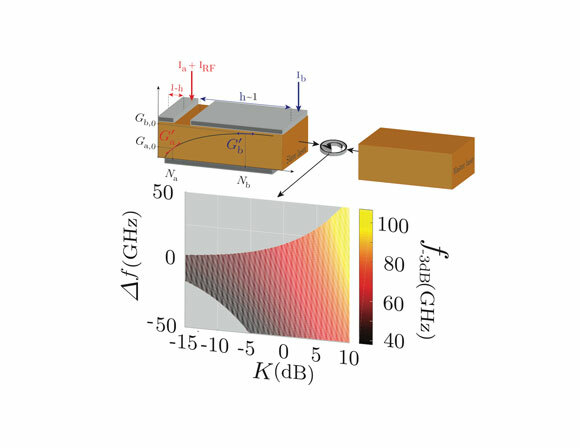 In this work, the researchers also reveal that unlike any directly modulated semiconductor lasers, the compression factor originating from gain nonlinearities does not affect the dynamical performance. For instance, calculations unveil that considering a practical injection strength, a high gain lever effect and a relatively large compression value allows us to maintain a modulation bandwidth of about 85 GHz that is four times larger than that for free-running laser operating without gain lever. Overall, these results give realistic guidelines for the development of novel types of broadband optical sources for direct modulation of light and operating at high-speeds. Further work will focus on investigating the potential of using quantum dot lasers from which large compression factors are usually observed.